Texas Legislature set to Honor Aggie Johnny "Football" Manziel with House Resolution. Texas A&M University Heisman Winning Redshirt Freshman Johnny "Football" Manziel took the nation by storm. He amazed all who watched him play and his stats blew SEC and National records out of the water. His accomplishments brought tens of millions of dollars in publicity to the Great State of Texas. Texas State Representative Harvey Hilderbran has filed a joint Texas House and Senate Resolution honoring Johnny Manziel. In other news, a Texas Judge is taking heat for posting on facebook about Johnny Manziel getting a speeding ticket from the Ennis Police Department. Lee Johnson, a Baylor Graduate, will likely face disciplinary action from the Texas State Judicial Ethics Commission. 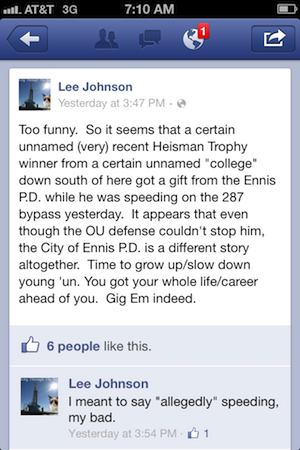 Lee Johnson, a graduate of Baylor and a municipal court judge in Ennis since 1987, might be in a little hot water after this post. At the very least (according to legal experts we consulted), his commentary is unethical and could result in some disciplinary action -- or force him to recuse himself from the case. Also, his actions probably won't go over well with some Aggie partisans in that football-crazy part of the state. Maybe I'm missing something, but what exactly is the PROBLEM with this post (by the judge). So, Johnny Football got caught speeding. Given he's a 20-yr-old kid, what's the surprise? As for the judge's comments, there was nothing even the least bit offensive about either Johnny, the Heisman Trophy, or A&M. It just seemed to me to be a bit of good-natured ribbing. Seriously, anyone who has a problem with this posting needs to learn to LIGHTEN UP! !